We are celebrating our 9th year at the Georgia Mountain Fairgrounds and we are excited for our largest Eggfest ever! Mark your calendar for May 17-18, 2019 and get your tickets soon! This beautiful venue is located along the shores of beautiful Lake Chatuge in the north Georgia mountain community of Hiawassee and is only two hours from Atlanta, Greenville, Asheville and Chattanooga. 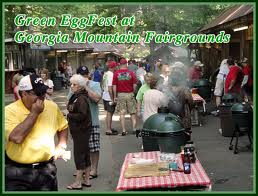 An Eggfest is a gathering of Big Green Egg fans and experienced cooks from all across the country and Canada. The cooks will be showcasing their skills and talents and will be preparing their specialty recipes all day long. The non-cooks (tasters) are free to stroll through the Georgia Mountain Fairgrounds, sample and experience wonderful "Egged" food while talking to the cooks about their recipes and techniques.